These stamps were used for printed matter postage like, newspapers, magazines, calendar etc. It is not entirely correct to call these stamps “Newspaper Stamps” only. These printed matter stamps were sold with discount. Not being sure of the exact discount amount, there are discrepancies between the sources that tells the amount of the discount. While some sources say that discount was 10%, some others say it was 15%, 25 or 30%. In order to prevent misuse of the stamps by the companies who bought them in bulk with discount (like reselling them or using them for regular postage) surcharges were applied to these stamps. As far as I understand, these printed matters have not been sold to private people. These overprints were applied randomly. Overprints exactly in the center are rare. Even though the theory that forged overprints are in the center of the stamp, this rule does not always apply. Upside down, off center, horizontal or one overprint on two stamps appear many times in these stamps so it is not fair for these overprints to be sold overpriced. It is also not possible for the postal officers to hand-stamp these small overprints on hundreds of these small stamps well centered. For that reason it is not true that these error overprints has been made by postal officers intentionally. Postal officers stamped two stamps with only one overprint (Figure 1) to save time and effort. That is why sometimes we see “half” overprints on some single stamps. Corners of the frame are filleted. 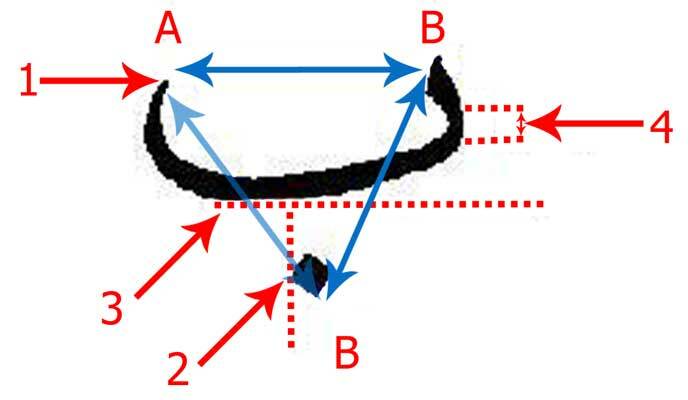 Horizontal dimension of the frame is 14.5 mm. Vertical dimension of the frame is 18.5 mm. 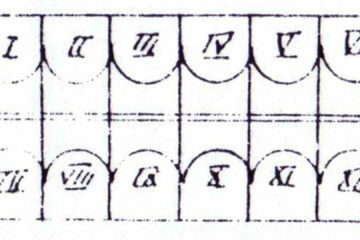 The length of the “IMPRIME” word is 18.5 mm. 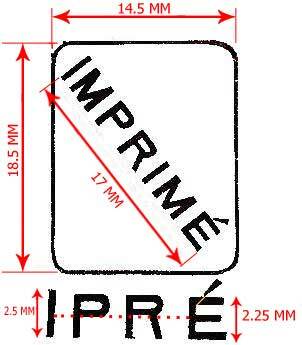 The length of letter “I” in word “IMPRIME” is 2.5 mm. The length of letter “E” in word “IMPRIME” is 2.25 mm. The letters “P” and “R” are slightly compressed vertically. Letter “R” is a bit more compressed than “B”. The line over letter “E” is in the middle of the top edge of “E” and has a 45° angle. This lines shows the inner corner of “E” (See yellow line in Figure 2). Middle horizontal line in letter “E” is always shorter that the ones on the top and bottom. Any overprints that do not follow any single one of these measurements and signs are forgeries. In this letter thick line gets thinner through the bottom. Tip is sharp; it even gives the impression that it is 90°. This period always centers with the letter “R” in “IMPRIME” word. Any overprints that do not follow any single one of these signs are forgeries. Forgeries are usually clean and readable. Genuine overprints exist clean and readable but are rare. 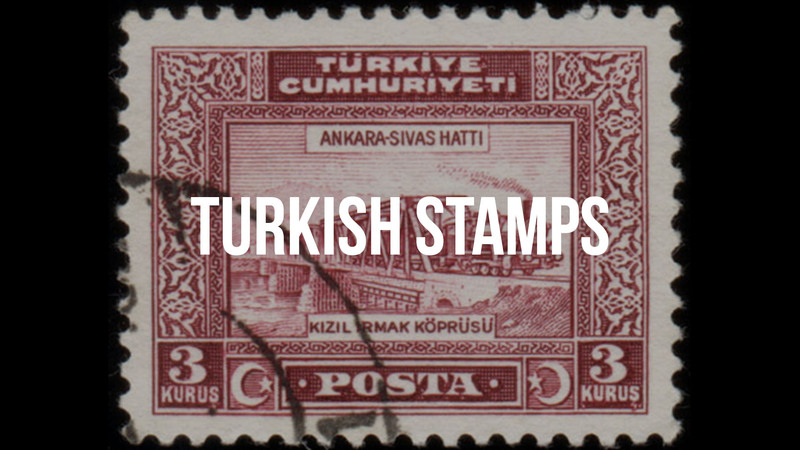 To determine how many of overprints were needed Ottoman Postal Service counted these overprinted stamps and recorded them. 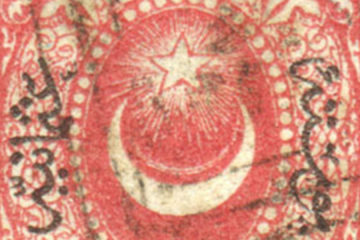 According to Tchakidji right side of this single “overprint seal” wore in time and left side of the overprint disappeared completely in 1892 “Toughra Ampir” stamps. If it’s correct that this singled seal travel between the post offices then we can assume that different ink color could have been used to apply it. By adding blue or red ink to the black inked seal pad that ran out of black ink, dirty blue or red overprints appeared on stamps. After dipping the seal into the pad, postal officers stamped 3-4 stamps back to back, because of that some of the overprints on stamps became gray-black. These overprints are rarely pure black. Gray overprints look “dry” and have speckles if looked under magnifying glass. There are examples of greasy black color overprints in year 1892. These overprints are usually on “1 Piastre” stamps and they are very rare. Pure blue and red overprints are always forgeries. These colors have never been used postally until 1913. As there were no regulations about using blue or red ink issued by the Postal Service postal officers used blue and red ink by taking orders from philatelists of those days. Some stamp dealers also used 1/3 black, 1/3 blue and 1/3 black overprints on a single plate of stamps for the reason that they did not have funds to buy extra black ink and they used the colors they already had in their hands. See Figure 4. As blue and red ink mixed with the black ink left on the seal pad, these blue and red colors are always dirty blue or dirty red. Black ink speckles are visible on these dirty color overprints under a magnifying glass. From this time on I will use the terms “dirty blue” and “dirty red” in this article. Crescent (Ampir) printed matter (newspaper) stamps with overprints has been issued at the beginning of July, 1891, some sources says the exact date of the issue is June 15, 1891. 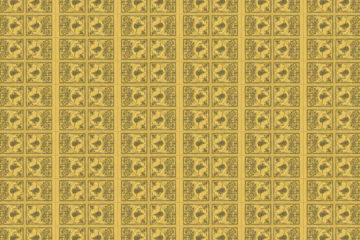 Overprinted 1891 Crescent (Ampir) printed matter stamps has been used until the end of June, 1892, three months after the issuance of Toughra Ampir stamps in March 10, 1892. According to Tchakidji Postal Service allowed a three months period for the companies to use these stamps in their stocks. If this statement is correct, then Overprinted Toughra Ampir stamps have been issued in mid June, 1892. It is said in some sources that 1892 overprinted Toughra Ampir printed matter stamps were last used in 1893. Considering that machine overprinted Toughra Ampir printed matter stamps have been issued in February 1893 as stated in old stamp catalogues this statement is not far from the truth. Overprinted printed matter stamps canceled after these dates are forgeries. As these stamps were in circulation for a short period of time they are less in numbers there are many forgeries in the market. High denomination values are even less in numbers. 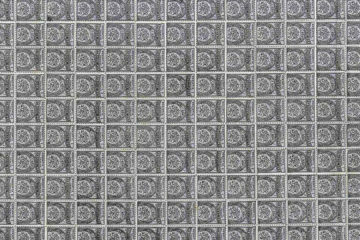 It’s been said that the count of these stamps are in between 3,000 and 20,000. 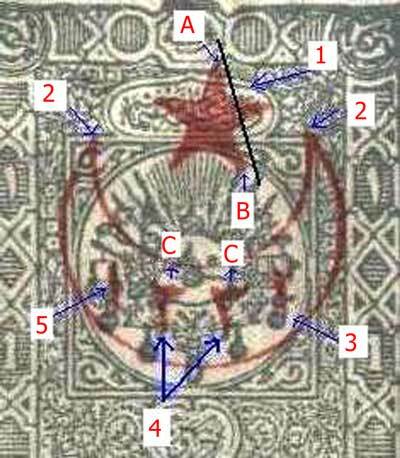 In an article, in a magazine published by E. Heger in February 10, 1914, Heger states that the overprint seal has been stolen from Postal Service in Istanbul and became in the possession of a stamp dealer in Vienna. If this statement is correct, the number of forgeries in the market are worse that stated above. I collected information about these overprints from different sources. This information is valid only for clean applied overprints. As these overprints have been applied by typography technique there could be printing errors in some stamps. This can only be cleared by researching a full plate. As I don’t own a full plate, information provided below is an overall description of the overprints. Tip is round and thick. Horse shoe shaped and tips are flat. Tip is sharp and bent upwards. Sharp corners (forgeries are rounded). Comma is shaped as in Figure 5. Ribbon shaped letter’s left part is thinner. Line is long as in Figure 5. Width of the over print is: 10.25 mm. Height of the overprint is: 4.25 mm. I will not mention about the forgeries as there are many of them. I suggest that philatelist use this as a guide to determine if an overprint is a forgery or not. Please keep in mind that ink being applied less or more than usual on the overprints does not mean that those overprints are forgeries. This information is valid only for clean applied overprints. Vertical line has always the same thickness. Tip is sharp, not round. 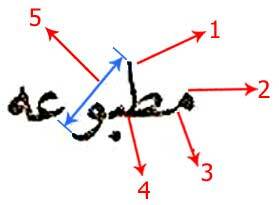 Dimension marked with blue arrow is 5.75 mm. Again there are many forgeries of this overprint. The genuine overprint is always dull and slightly oblique to the left. From the intersection of the vertical line on the left side of the rectangle period in and horizontal line at the bottom of the letter “B”, letter “B” oblique upwards. This oblique angle is always the same for every overprint. See Figure 6. This part starts vertical and then bends inwards toward the letter itself. Dimension of this vertical part is 2 mm. 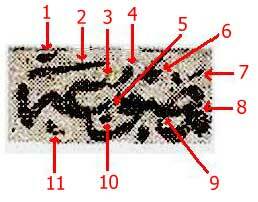 Forgeries don’t have this “vertical” part and they bend inwards smoothly. Dimensions that blue arrows show are all 8.5 mm. Examples of Fournier forgeries: Another matter to consider is the cancellation dates of these stamps. 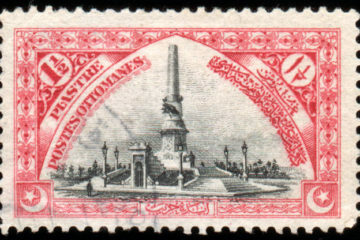 In ISFILA catalogue the cancellation of these stamps were stated as September 1, 1905. On the other hand Pulhan stated this date as 1906. Dr. Pirl, in his article he wrote in 1912, stated that these stamps have been issued in December 14, 1906 by the order of Postal Service. In my opinion this date is the correct issuance date of these overprints. We can say that overprinted stamps canceled before this date are forgeries. A small line and almost horizontal. In forgeries this line is almost vertical and/or has a comma and/or semicolon shape. Long line. Tilted up from left to right. Upper left tip is thinner than lower right tip. Thin line, tilted from left to right. Forgeries usually have semicolon shape. Lines in this part always touch each other or very close to each other. Gap is bigger in forgeries. Lines in this part always touch each other. Forgeries have gaps in this part. A very small shaped comma. Round shapes are forgeries. Very close to “L” shape and is thin. Any overprints that do not follow any single one of these signs are considered forgeries. Side “A” and side “B” is not parallel to each other. This is a significant property in these overprints. Tips of the crescent bent inwards. 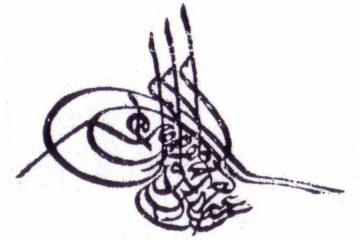 Tips of crescent on forgeries bent other directions. 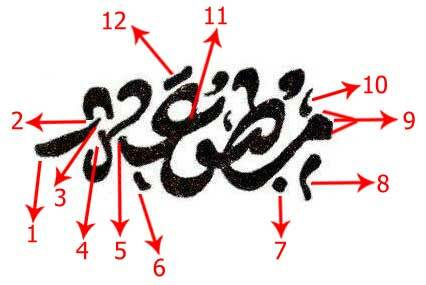 Bottom tip of the number is bent and has a distance from the lower arc of the crescent. 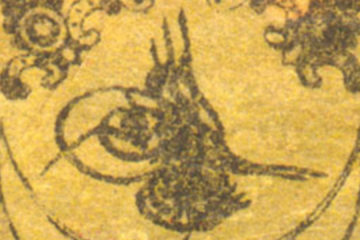 In forged overprints this number is closer to the lower arc of the crescent. The tips of these numbers marked with “C” are always vertical. In forgeries these tips either do not exist or are oblique. This “number” has a thin shape and is slightly bent. Tip of this number in forgeries either thick or/and not bent at all. 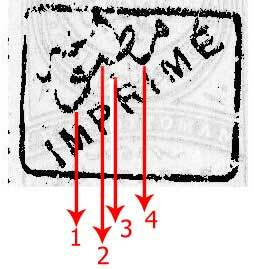 Has “Imprime” overprint on 1890 emission stamps been applied by Ottoman Postal Services? And are they genuine? Is the color of the overprint black or are there also blue and/or red overprints? 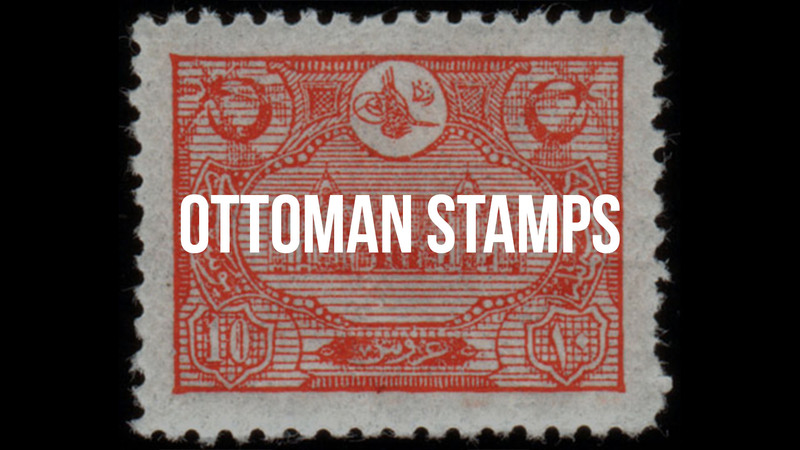 “Ottoman Postal Service has never issued printed matter stamps until this day. Some of the newspaper owners have been allowed to use discounted stamps. In order to prevent these stamps to be resold to others, these stamps have been marked with an overprint. These stamps are to be only used on newspapers. There is only a single overprint seal and is allowed to be used only in certain post offices. You also should know that printed matter overprints should not be on the postage due stamps. There is no regulation about the color of the overprint. Because of that black and blue overprints exist. I have the information that red overprints were applied as per the request of some philatelists. With this information at hand it will be suitable to call these stamps as ”discounted stamps overprinted with printed matter inscription” rather than “printed matter stamps”. 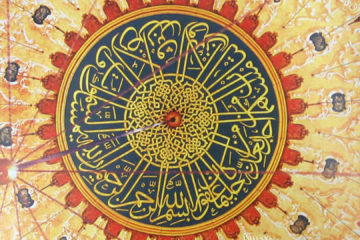 As the publisher of the communication between European philatelists and Ottoman Postal Service did not show the genuine documentation only “newspaper” word has been used. In another article, A. Doursun wrote “it’s been used for newspaper and books”. It is possible that the publisher used the word ”newspaper” referring to this article. We also should keep in mind that “newspaper” in German also means “printed matter”. There are examples of these overprinted stamps used on letters in some of the auctions. These examples are either “fantasies” or forgeries. In my opinion “printed matter” overprinted Toughra Ampir stamps have been issued on or after February 1894. ISFILA dates these stamps as1893 but Pulhan dated these stamps correctly as 1894.